Al-Biruni is regarded as one of the greatest scholars of the medieval Islamic era and was well versed in physics, mathematics, astronomy, and natural sciences, and also distinguished himself as a historian, chronologist and linguist. He was conversant in Khwarezmian, Persian, Arabic, Sanskrit, and also knew Greek, Hebrew and Syriac. He spent a large part of his life in Ghazni in modern-day Afghanistan, capital of the Ghaznavid dynasty which was based in what is now central-eastern Afghanistan. In 1017 he traveled to the Indian subcontinent and authored Tarikh Al-Hind (History of India) after exploring the Hindu faith practiced in India. 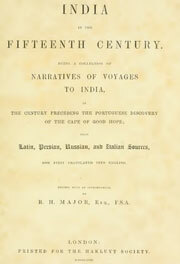 Narratives of voyages to India in the century preceding the Portuguese discovery of Cape of Good Hope. From Persian, Russian and Italian sources translated to English. 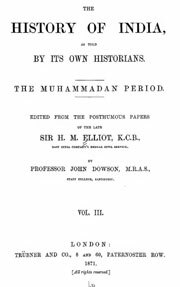 An exhaustive work on the role of Islam in the province of Bengal from the early 13th century to the second half of nineteenth century. Mortimer Durand (14 February 1850 – 8 June 1924) was a British diplomat and civil servant of colonial British India. 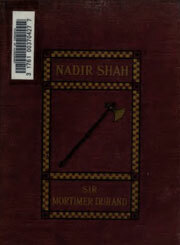 This book is about eighteenth century Turkoman soldier of fortune, Nadir Kuli, better known to the world as Nadir Shah, raised Persia to the first place among Oriental powers ; and notwithstanding the insane hatred which during the latter part of his life he showed towards his sensitive and quick-witted people, who had fought well for him, he is regarded by Persians of the present day as one of the greatest of their national heroes. 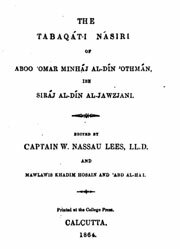 Tabaqat-i-Nasiri a medieval text by Minhaj-i-Siraj. 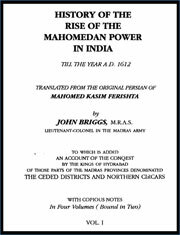 It is an important source book for the reconstruction of the history of foundation of Muslim rule in Bengal. 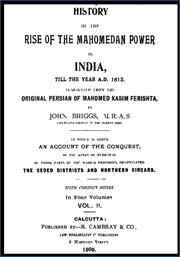 The history of the first fifty years of Muslim rule in Bengal is found only in this text. Tabaqat-i-Nasiri is the only authentic source for the history of Bengal from the conquest of Muhammad bakhtiyar khalji till 1259 AD, when it comes to an end. Evidence in literature suggests that in 1193, the Nalanda University was sacked by BAKHTIYAR KHILJI, a Turk. The Persian historian MINHAJ-I-SIRAJ, in his chronicle the TABAQAT-I-NASIRI, reported that thousands of monks were burned alive and thousands beheaded as Khilji tried his best to uproot Buddhism. The History of India as told by its own historians. The Muhammadan period. Edited from the posthumous papers of the late Sir H.M. Elliot by Professor John Dowson. 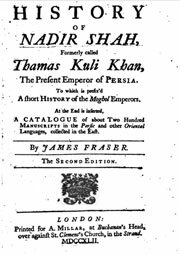 Nadir Shah was one of the most powerful Iranian rulers in the history of that nation, ruling as Shah of Persia from 1736 to 1747 when he was assassinated during a rebellion. Because of his military genius as evidenced in numerous martial encounters throughout his campaigns, such as the battles of Herat, Mihmandust, Murche-Khort, Kirkuk, Yeghevard, Kheibar pass, Karnal and Kars, some historians have described him as the Napoleon of Persia. 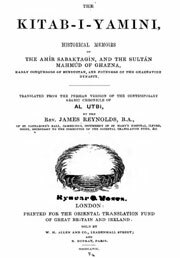 The Kitab-i-Yamini : Historical memoirs of the Amir Sabaktagín, and the Sultán Mahmúd of Ghazna, early conquerors of Hindustan, and founders of the Ghaznavide dynasty. Translated from the Persian version of the contemporary Arab chronicle of Al Utbi. 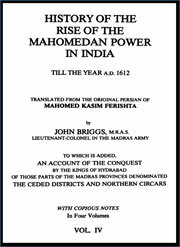 A chronicle of initial Arab invasions to the establishment of the Mughals in 16th century. 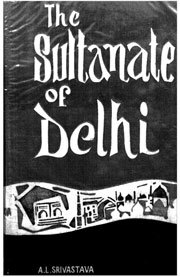 There was a lot of heroic resistance by Hindus and many successive Islamic sultanates in Delhi. This books covers it all. 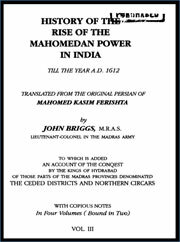 Detailed account of all Islamic invaders from Mohammed Ghazni to Taimur, Babur, Akbar, shah Jahan, Jahangir and Aurangzeb. The author was born in Astrabad on the border of the Caspian sea in about 1570 AD. He came to Bijapur in 1589 AD and spent the rest of his life in the court of Shah Ibrahim Adil 2 of the Adilshahi Sultanate. Adil 2 commissioned him to write a history of India. 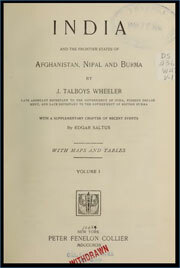 James Talboys Wheeler (Oxford, December 1824 – Ramsgate, 13 January 1897) was a bureaucrat-historian of the British Raj. 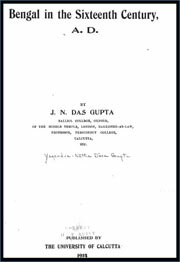 In 1858, he determined to develop his literary talents by becoming editor of the Madras Spectator in India. 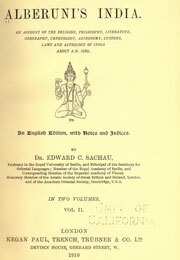 Later in that year he was appointed professor of moral and mental philosophy at Madras Presidency College, and during his four years in that position his interest in Hindu customs was piqued as a consequence of his contact with Indian students. 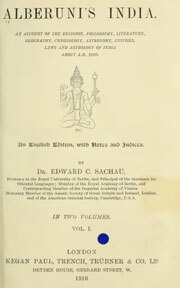 He believed that the Europeans in India were largely ignorant of the Hindu perspective on family life. For it seemed to me, under the circumstances, not altogether inappropriate to try to study the past of Bengal, and there is a special fittingness in the task if that past can be elucidated with the help of materials derived and evidence gathered from some masterpiece of Bengali literature. If we have had in the past successful examples of the economic interpretation of history, we have no less successful examples of historical interpretations of literature. I have hence ventured to invite you to study thesocial and economic condition of Bengal in the 16th century of the Christian era with the help of a few Bengali poems whose names are household words with the gentry as well as the peasantry of this province. A persian history of the Gujrat region written in 1611 AD. 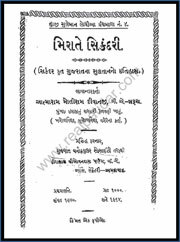 It is a detailed study of Cultural and Social Conditions in Gujarat. 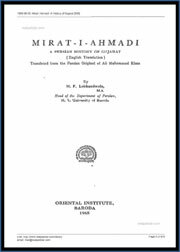 Mirat-i-Ahmadi; a Persian history of Gujarat. 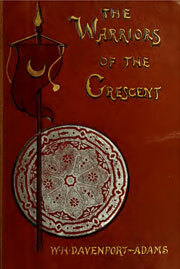 English translation, translated from the Persian original of Ali Muhammad Khan, by M. F. Lokhandwala. 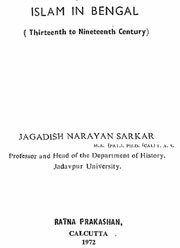 As Jadunath Sarkar the famous historian has stated in his foreword, Gujrat is the richest in its number and variety of historical records. Undoubtedly Mirat i Ahmadi is the most important of the number of historical chronicles in Persian composed about history of Gujrat. 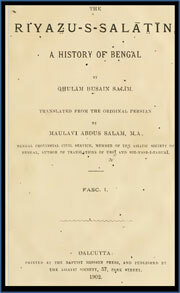 Riyazu-S-Salatin; A History of Bengal written in Persian and translated into English by Maulavi Abdus Salam is a rare and great piece of history of Bengal. It covers the whole Muslim rule from BAKHTIYAR’s conquest of Nadia in 1204-05 AD to the battle of PALASHI in 1757. Written almost 20 years after the much talked about Battle of Plassey, it depicts a picture of Bengal history of a time when Muslims lost authority and the East India Company traders who took control of Bengal (Diwani) through shere deception, banditry and power of the gun. 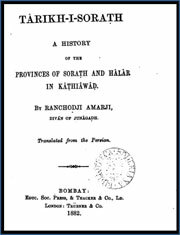 The Tarikh I Sorat or the history of Sorath and Hajiar was compiled by Ranchodji Amarji diwan of Junagarh about 1825 and gives a pretty circumstantial account of the factions and broils that disturbed the provinces during the lifetime of the author and his father. As a genuine native history written by a man who took part in the main events that he describes and who was independent of British influence, it ought to poses some interest for the general reader. 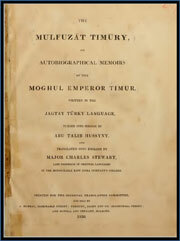 The History of Timour, written by himself, carries with it the strongest proofs that he wrote for posterity only ; and that he could not,in prudence, or in policy, make his work public during his life : for it contains not only the same accurate detail of the facts and occurrences of his reign, as are found in other authors, but it goes much further. He gives you that which he only had the power to give, the secret springs and motives which influenced his conduct in the various political and military transactions of his life, the arts by which he governed, as well as the power by which he conquered. He acknowledges his weaknesses, honestly owns his errors, describes the difficulties in which he was occasionally involved by those errors, and the policy by which he surmounted and overcame those difficulties.